Is there anything better than fresh mozzarella cheese? We have always wanted to make our own , but honestly thought it would be a huge undertaking. So with another day stuck in the house because of frigid outdoor temperatures, it was the perfect time to do a little research to accomplish this “self-sufficiency, make-it-ourselves” goal! We used Junket rennet tablets to make our cheese, as we didn’t have time to order organic liquid vegetable rennet. 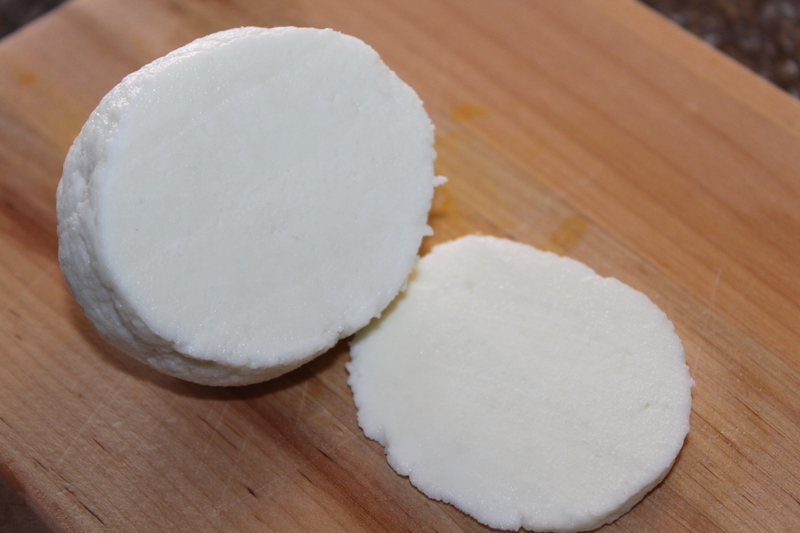 Along with water, there are two somewhat non-traditional ingredients needed for making your cheese. One is to get milk that is not ultra-pasteurized. For that – we were lucky enough to have a store close by that stocks milk from a local farm. The other ingredient is rennet – of which I had no idea what it was. After investigating all the details of rennet – what it was, what it looked like, and where to find it in the grocery aisle, we began to make a few phone calls to source it locally. Our original plan was to purchase vegetable rennet in the liquid form. Unfortunately, it was nowhere to be found in the area where we live. 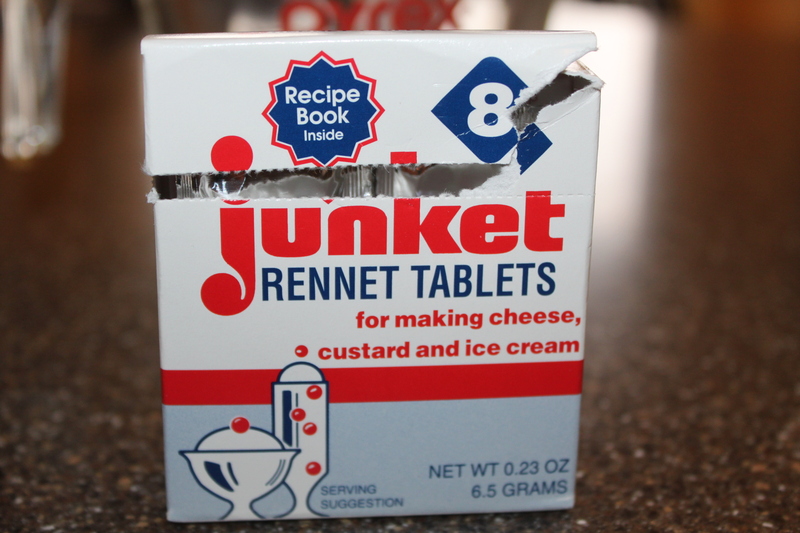 We settled on Junket Rennet tablets – found in the grocery where you would buy your pudding/jell-o. Now we can say that our pizza is truly homemade – using our own pizza crust (see recipe here), pizza sauce (see recipe here), and mozzarella cheese! Of course, we can’t wait until summer arrives here in Ohio so we can add our own fresh tomatoes, peppers and onions to top it off! And who can resist mozzarella cheese with a slice of a tomato straight from the garden, topped with a little basil. Summer can’t get here soon enough! 3. Place 1 gallon of milk into a non-reactive pot. Heat on Medium-Low until it reaches 50-55 degrees F.
12. 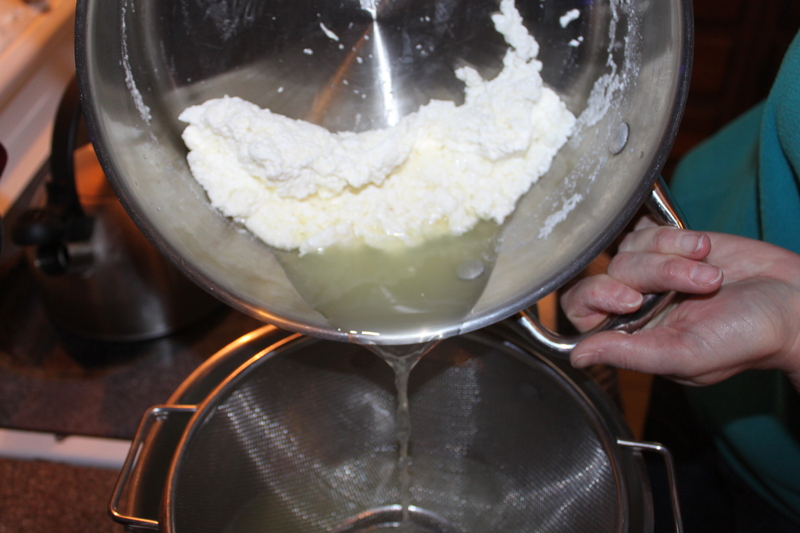 Using a slotted spoon, transfer the curds to a colander set over a bowl in order to catch the draining whey. Rotate the colander and remove as much whey as possible. You can let it sit for 15 minutes while it drains, or use your hands to gently squeeze the whey out of the cheese. 15. Add it to the microwave one more time for 20 seconds. 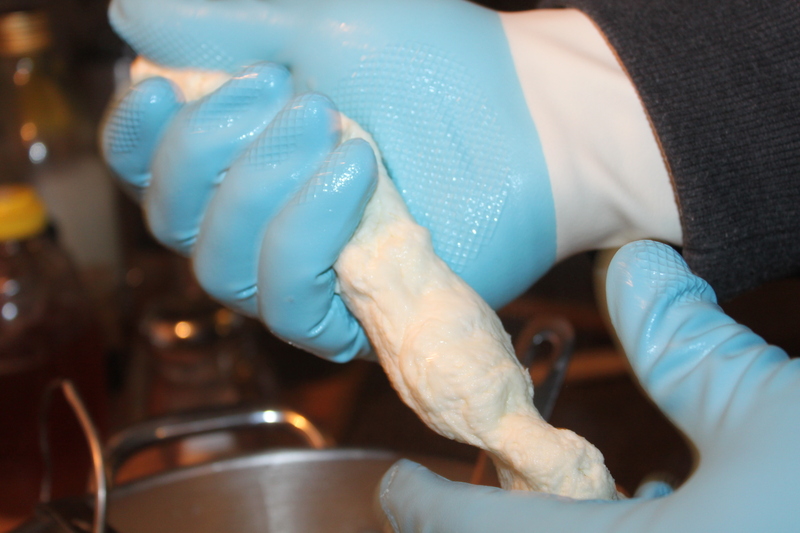 Begin stretching the cheese – it should stretch like taffy. Add salt if desired. Continue to stretch, fold and knead until shiny and smooth. If it breaks easily – add it back to the microwave until warm. 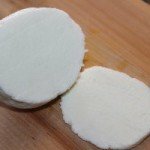 You can add a little whey back into the mozzarella also to make it more pliable. 16. Fold it underneath itself to make it into a ball. Add it to a bowl of ice water to immediately cool for 20 minutes. If you are not going to eat it right away – place mozzarella (still in the ice water) in the refrigerator for 3 hours. Remove cheese and wrap in a plastic wrap for up to 7 days. 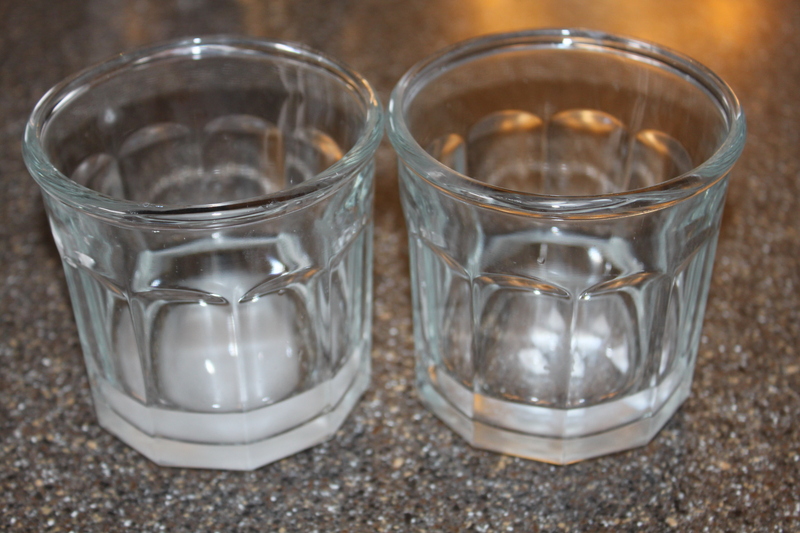 * You can also store it in a liquid brine solution – however, I don’t like the extra taste of salt on my cheese. Place 1/4 cup of water into a small bowl. Crush the Rennet tablet and dissolve in the water. Place 1/4 cup of water in another small bowl. Add 1 teaspoon of citric acid and stir. Place 1 gallon of milk into a non-reactive pot. Heat on Medium-Low until it reaches 50-55 degrees F.
Add mixture of water/citric acid and stir for one minute. Add the remaining 1 teaspoon of citric acid (that is not mixed with water) and stir for an additional minute. Turn off the heat, remove the pot from the heat source, and stir in the rennet mixture for approximately 20 seconds. Cover the pot, and let sit for 20-30 minutes — DO NOT disturb the mixture at this time. The mixture should be set and not look like liquid. Cut a one inch checkerboard pattern into the cheese – making vertical cuts and then horizontal cuts. Let the curds sit for 10 minutes. 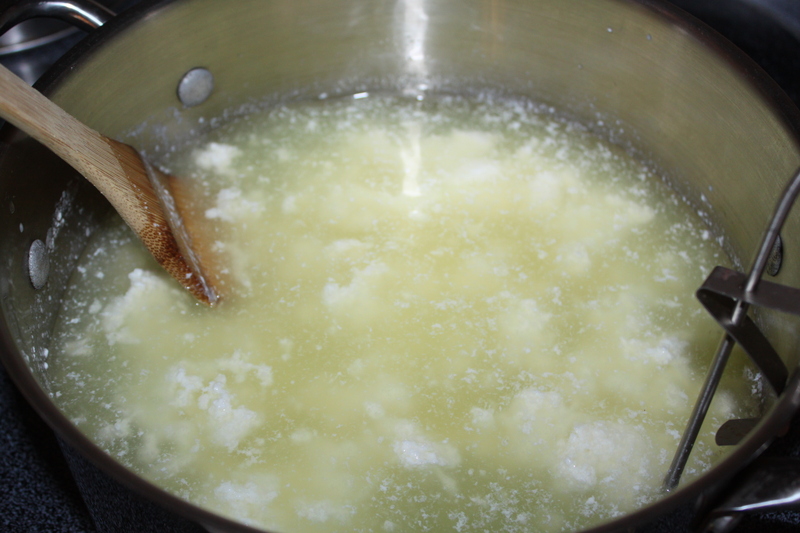 Return to the low-medium heat – Heat to 105 degrees allowing the whey (the greenish liquid) to separate from the curds – stirring occasionally. 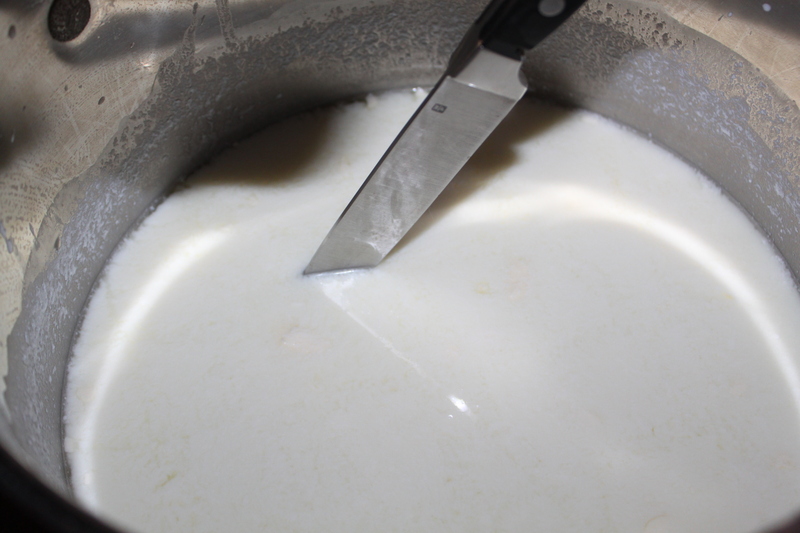 Using a slotted spoon, transfer the curds to a colander set over a bowl in order to catch the draining whey. Rotate the colander and remove as much whey as possible. You can let it sit for 15 minutes while it drains, or use your hands to gently squeeze the whey out of the cheese. Place cheese in a glass bowl. Microwave for 35 seconds – drain off the whey using a spoon to press the cheese gently against the bowl, or by gently squeezing the cheese. Key word — Gently! Microwave again for 20 seconds and repeat the process to drain the whey off of the cheese. Add it to the microwave one more time for 20 seconds. Begin stretching the cheese – it should stretch like taffy. Add salt if desired. Continue to stretch, fold and knead until shiny and smooth. If it breaks easily – add it back to the microwave until warm. 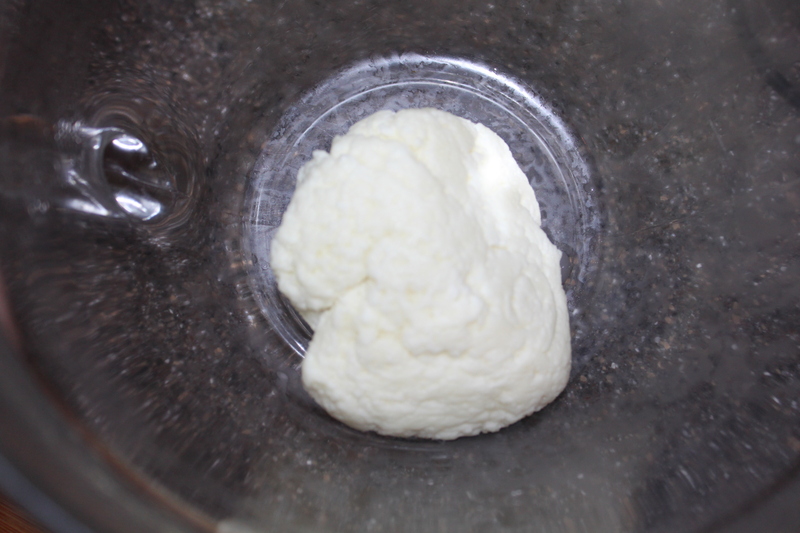 You can add a little whey back into the mozzarella also to make it more pliable. Fold it underneath itself to make it into a ball. Add it to a bowl of ice water to immediately cool for 20 minutes. 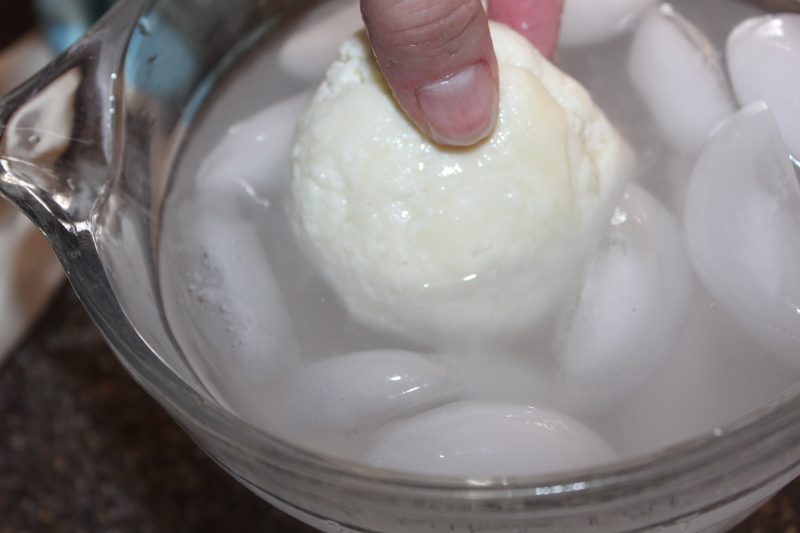 If you are not going to eat it right away – place mozzarella (still in the ice water) in the refrigerator for 3 hours. Remove cheese and wrap in a plastic wrap for up to 7 days. * You can also store it in a liquid brine solution – however, I don’t like the extra taste of salt on my cheese. oldworldgardenfarms February 28, 2014 February 5, 2019 Recipes, Sauces Dressing Jams Misc.